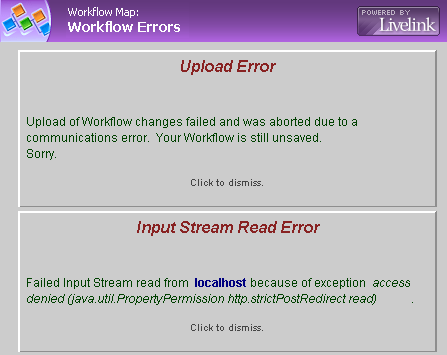 Upload Error: Upload of Workflow changes failed and was aborted due to a communications error. Your workflow is still unsaved. Sorry. Never had these errors before and after some investigation the problem was…. Firefox! Using Internet Explorer was fine. The strangest thing is that when I create a new workflow in Firefox and save it, there’s no issue, but when I open this particular workflow and make any sort of change it throws those errors (I could even open the workflow, make no changes and save it). P.S. ScribeFire isn’t uploading images, go figure, so Windows Live Writer to the rescue. Live Writer is feature rich and with a sweet WYSIWYG editor but I rather not open another application just to blog. Simplicity FTW! available when the editor is opened in a tab. please tell me how did you resolve this because i’m facing the same problem. “This is an issue with any instance and workstation that has all of the following: 1) IPv6 enabled on the server 2) Java 1.5_18 or later on the workstation 3) The content server (livelink) system is configured to use the IP inside its cookie 4) The URL that the user is accessing does not reference the server by its IP When all of these conditions are met, this error will happen. The only workaround currently is to remove one of the items above by either not using the IP address in the cookie, using the server’s IP address in the URL instead of the DNS name, downgrading the workstation’s version of java, or disabling IPv6. Our developers are still investigating a possible solution for this issue, but I do not have any additional details at this time. If you would like to be added to the list of affected customers, please open a ticket with Customer Support. Once we have an official ticket number, we can add you to the list. I hope this is helpful.